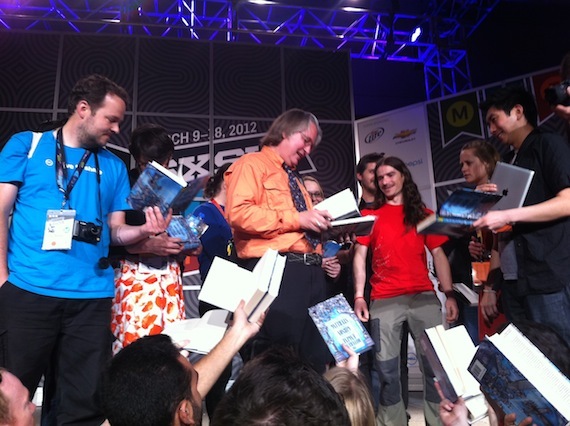 The line wound all round the 4th floor of the Austin Cnvention Center for sci-fi author/"transglobal futurist"/"American original" (according to his introducer) Bruce Sterling at SXSW Tuesday evening. Sterling, who's given the closing speech at the Interactive portion of the festival for years now, delivered several notable one-liners, and, more memorably, some stinging cultural assessments to carry with us till next year, and hopefully, the years to follow. Read on for some of the best quotes from "The Ultimate Bruce Sterling Talk" -- we didn't catch them all, because we were too busy taking in his words. "People show up to watch me... be grumpier every single year because objectively things are getting worse. We're fully vested in lying to ourselves about them." "They suffer a lot, but they don't lie about their problems [narcotics]." But there's one thing that bothers me. Although SXSW people do look chic, it's a rather retro look. They don't actually look very futuristic. I would suggest, when you come back next year... come back in robotvision glitchcore. Man, you would rule the physical universe. It would be like a silent coup, people wouldn't know what to make of it. And it would outdo the film people." "[There's] a new phenomena that I like to call the Stacks [vertically integrated social media]. And we've got five of them -- Google, Facebook, Amazon, Apple and Microsoft. The future of the stacks is basically to take over the internet and render it irrelevant. They're not hostile to the internet -- they're just [looking after] their own situation. And they all think they'll be the one Stack... and render the others irrelevant. And they'll all be rendered irrelevant. That's the future of the Stacks. People like the Stacks, [because] the internet is scary now -- so what's the problem there? None of them offer any prosperity or security to their human participants, except for their shareholders. The internet has users. Stack people are livestock -- ignorant of what's going on, and moving from on stack to another. The Stacks really, really want to know you're a dog. They're annihilating other media... The Lords of the Stacks. And they're not bad guys -- I'd be happy to buy them a beer. But really, a free people would not be so dependent on a Napoleonic mobile people. What if Mark Zuckerberg trips over a skateboard? This structure won't last very long... But you're really core people for them and their interests. You are them. I'm them. And your kids are going to ask embarrassing questions about them. And there are voices here and there complaining about them, [like] Jonathan Franzen. He says Twitter is destroying literature. And he's right. So don't make fun of him. He's telling the truth." "[I'm] really liking Kickstarter, the type of project that shows up and gets funded... they're handing out more money than the NEA.. if this goes on, it won't be long before geek art... is our dominant means of popular expression. A tidal wave of Kickstarter tech art is going to sweep the land." "Information wants to be free, but it also wants to be archived. Time is no kinder to information than it is to any mythical substance." "You guys are my people. So come get your books," he closed, waving to stacks of books on the stage.